A new federal tobacco tax will make it more expensive for smokers to buy their cigarettes. Money from the tax increase will be used to expand health insurance coverage to kids from low-income families. Ashley Milne-Tyte reports. Kai Ryssdal: States have been slapping taxes on cigarettes for years now. But tomorrow the price of a pack is going up everywhere. 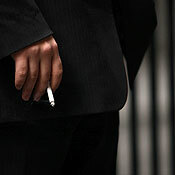 The federal government is raising its tax on a pack of smokes from 39 cents to more than a dollar, $1.01 to be precise. And there are going to be higher taxes on other tobacco products too. The money is going to go to the State Children's Health Insurance Program; it covers kids whose families can't afford it. Ashley Milne-Tyte has more on what effect the increases will have on the program and on smokers' pockets. ASHLEY MILNE-TYTE: The government hopes the tax will raise almost $33 billion for kids' health insurance during the next five years. Genevieve Kenney is a senior fellow with the Urban Institute. GENEVIEVE KENNEY: It is absolutely a funding source that can be counted on in the short run. But maybe not in the long run. The Urban Institute says in the past some states that levied tobacco taxes found they raised less than they expected, as smokers bought their cigarettes in other states. Kenney says the federal tax is sure to have one long-term benefit. KENNEY: It works by reducing the number of smokers, or the number of cigarettes that are consumed. With a recession on, some people are already kicking the habit even before the tax kicks in. Patrick Reynolds runs the Foundation for a Smoke Free America. He says now's the perfect time to introduce an extra incentive to quit. PATRICK REYNOLDS: I believe a higher cigarette tax is going to have a greater impact in a recessionary economy because people are financially sensitive. New Yorkers are already paying $10 a pack so you'd think they'd be prime candidates for giving up. Not according to Donovan Peters, who was taking a smoke break outside his midtown office building. He says cigarettes can always be had for less, so smokers still have a few options. DONOVAN PETERS: Indian reservations, they have those mail-order cigarettes, things like that. And I know my sister, I have my best friends in Florida, so that's probably where I'm gonna be getting mine from now on. He says the recession may be biting, but he doesn't have the fortitude to give up. In New York, I'm Ashley Milne-Tyte for Marketplace. Email addresses are never displayed, but they are required to confirm your comments. All comments are moderated. Marketplace reserves the right to edit any comments on this site and to read them on the air if they are extra-interesting. Please read the Comment Guidelines before posting. Think you could balance the federal budget? Play the game. Intimate profiles of workers in the global economy. Find past stories by . . .
How are the credit crisis and economy affecting your finances? What's your mortgage or home-buying story?